STANDISH -- Errors can make or break a baseball game. STANDISH — Errors can make or break a baseball game. For the Richmond baseball team, it was the latter, and at the worst possible time. The No. 3-seeded Bobcats made five errors, including a four-error fourth inning, to drop the Western Class D regional final 8-5 to No. 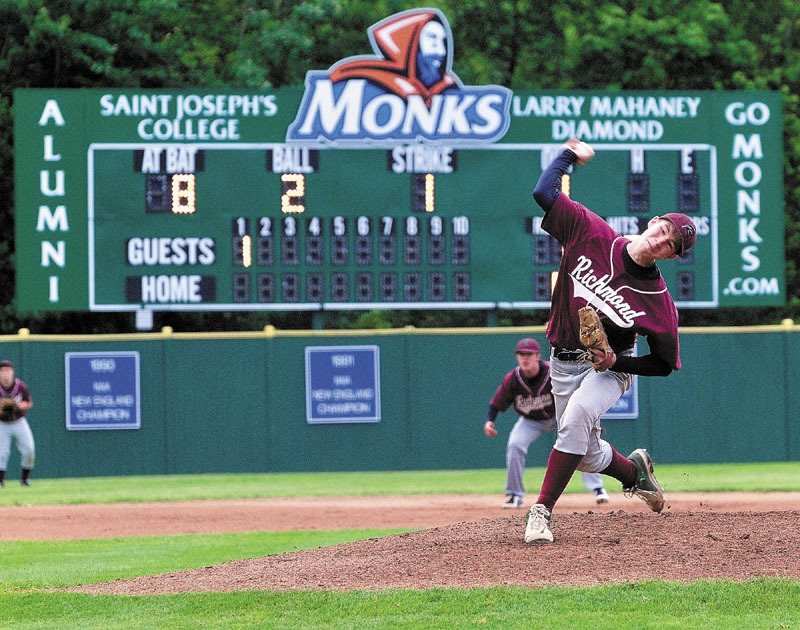 1 seed Buckfield on Thursday night at Larry Mahaney Diamond on the campus of Saint Joseph’s College. The Bucks (14-1) will play Bangor Christian for the Class D title Saturday in Standish. Richmond, the only team to give the Bucks a loss this season, ends the season with a 7-8 record. Up 3-1 heading into the fourth, Buckfield’s Jeff Pepin led the inning off with a single and stole second. He later scored on Richmond’s first error of the inning. Keenan Stockdale reached first on an error and later scored on an RBI single to right field by Ben Strout, tying the game 3-3. Buckfield added four more runs in the fifth inning, highlighted by an RBI triple by Pepin, to give the Bucks a 7-3 lead. Richmond responded in the top of the six with two runs, as Dakoda Roinestad plated Randy Moody and Bailey Johansen with a two-run single to bring the score to 7-5. Roinestad led Richmond with four RBIs in the game. “That’s one thing I’m very proud of, they never said die,” Gardner said. Buckfield scored its final run in the top of the seventh, as Jonah Williams scored from third base on a successful double-steal attempt. Williams, who came on in relief of starter Garrett Hamann in the sixth, closed the door on Richmond in the seventh, striking out three batters to end the game. Hamann, who struck out eight batters, including six in the first two inning, earned the win for the Bucks. Buckfield coach Joe McLaughlin said his team was prepared to face a tough Bobcats team, a group that beat the Bucks 5-4 back on May 7. Mike Stewart was the tough luck loser for Richmond, striking out eight batters and walking two. Only two of his seven runs were earned. The Bobcats struck first in the top of the first. Tyler Soucy hit a bloop single to right and advanced to second on a stolen base before Eddie Stewart scored Soucy from second on an RBI single to give Richmond a 1-0 lead. Buckfield responded in the second. Pepin led the inning off with a walk and stole second, before Hamann scored Pepin with an RBI double to left, tying the game 1-1. Richmond added two more runs in the top of the fourth, when Roinestad smacked a two-run single up the middle to score Mike Stewart and Johansen to take a 3-1 lead before the Bucks tied the game in the fourth.